An iconic image of the long, dark years of the Soviet Union is that of a weary babushka with a string bag queuing for some unappealing-looking food item. Nowadays, those very bags have become a retro design classic, an eco-friendly fashion statement available in a variety of colours. They share this status with hundreds of other Soviet-era products, now the height of only slightly ironic fashion. There is the indestructible bevelled drinking glass designed by Vera Mukhina in 1943 (Mukhina also created the Worker and Peasant Girl sculpture now lovingly reinstalled in central Moscow), the LOMO cameras and the souped-up Lada semyorkas (Lada “the seven”) now shuddering with the pounding bass of the sound system and driven by teenagers who don’t remember the jokes or the USSR. “Can you give me a hub cap for my Lada?” says the old man to the garage mechanic. “OK, that seems like a fair swap,” replies the mechanic. Soviet nostalgia is sweeping the internet as sentimental souls swap photos of old Intourist brochures for Sochi and Yalta, stamps bearing images of Soviet heroes and commemorating Cosmonauts’ Day, fat plastic nevalyashka dolls, orange and white spotted crockery, even match boxes and ice-cream wrappers. 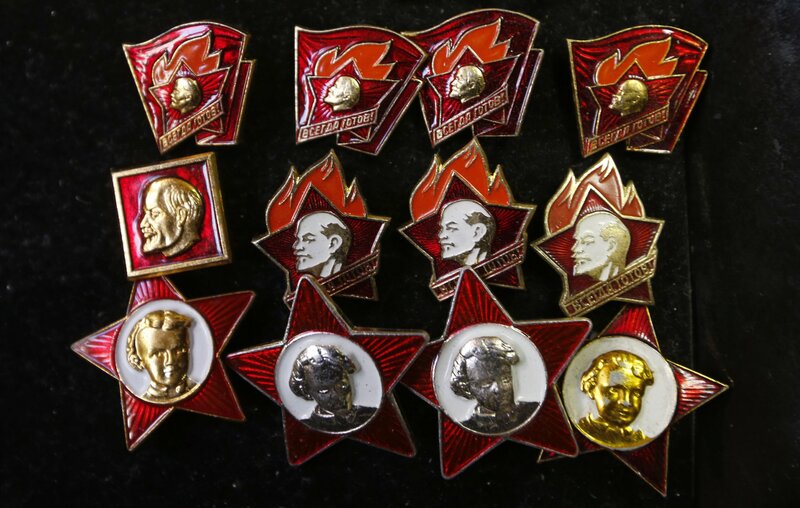 Websites such as sovietgifts.com seem unable to satisfy a ravenous longing for an idealised past. One site, savok.name, takes its title from an old insult meaning both dustpan and Soviet Citizen (“jobsworth” in this context) and is subtitled “Our Motherland! The USSR”. Like other similar sites, it showcases the fabulous posters of steel-jawed youths bearing farming implements and weapons, as well as other quotidien items, now almost fetishistic objects, such as Melodiya vinyl records, the Buran snowmobile, hairdryers and pegs. All this is not the expression of an actual wish to resurrect the USSR, though as many as 50% of Russians would like to. No, this is more of a wallow in something irrevocably lost, a “you don’t know what you’ve got until it’s gone” feeling experienced by people whose whole ideology was obliterated in an instant and all that is left is the memorabilia. “Real freedom means not worrying about being thrown out on the street because you cannot pay for your home, that you will have a pension and be able to have a nice vacation every year and that you can get all the education you want to advance your status in life as well as health care totally free,” writes Lisa Karpova in Pravda. For, despite the brutality of the Soviet era, people are looking back to what they perceive as an age of relative innocence and, perhaps, blamelessness. In the USSR the state was responsible for the bad and the good, whereas now, when things are disastrous, people have only themselves to blame. Though Soviet citizens may have feared the mighty retribution of the state, Russian citizens are prey to a new kind of fear – paying the bills. “Westerners lack much of the knowledge they need to understand the loss that Russians feel: the total world of a culture, the security, the depth of a social life that cannot be changed to fit an ideology,” Karpova explains. Olga Fedina is the author of the unapologetic nostalgia trip What Every Russian Knows (And You Don’t). She says that part of the huge nostalgia phenomenon is about shared experience – in 1990, for example, more than 286 million citizens consumed the same culture and used the same household items. Post-Soviet culture, she says, has failed to produce a uniting frame of cultural references. Ilya Utekhin of the European University in St Petersburg, who runs the website Communal Living in Russia, a ­virtual museum of Soviet life, kommunalka.colgate.edu, points to an unquenchable thirst for the unattainable, saying that “nostalgic images of bygone Soviet happiness are as mythological as images of the West once were. People have just changed one myth for another one”. Anya Von Bremzen, author of Mastering the Art of Soviet Cooking, would probably agree. She writes of a current “Made in the USSR” window display on Red Square, a retro supermarket amusingly named Gastronom 1 and of Stolovaya No. 57, a Soviet replica canteen serving buckwheat kasha (porridge), glasses of buttermilk and stewed cabbage. These things, like the phenomenal beauty of Stalin’s metro system, can now be appreciated as they are, stripped of ideology but imbued with memory. Vladimir Putin, primarily focused on his domestic audience, is a master of manipulating his people’s emotional attachment to the Soviet iconography. After all, he brought back words to the Russian national anthem, which aren’t significantly different to the lyrics of the Soviet anthem, and declared the end of the USSR “the greatest geopolitical catastrophe” of the 20th century (an accolade for which there is plenty of competition). Says Utekhin: “Putin uses Cold War rhetoric as a substitute for national identity,” in many ways taking over the Soviet brand to best further his own authoritarian agenda. Many Russians, of course, supported his invasion of the Crimea as a return to the glorious Soviet past. Putin understands precisely what Dostoevsky’s Grand Inquisitor (the philosophical backbone to The Brothers Karamazov) means when he argues that ordinary people cannot cope with freedom. In giving man freedom of choice, religion has doomed the majority to suffering. The masses, he explains, can only live in happy ignorance if they are ruled by those strong few who can bear the burden of freedom. People have to be fed before they can be virtuous, he says. The Communists practised this religiously, so to speak, and it is the Grand Inquisitor phenomenon that, perhaps, goes some way to explaining the huge popularity of Soviet retro kitsch and the accompanying feeling of rose-tinted sadness when faced with a Cheburashka mug (a Soviet cartoon creature), the Goodnight Children television lullaby with tear-jerking animation or the soothing chug of a vast ZiL refrigerator.